One of my quilting buddies lives in Virginia and has a family farmhouse that the family is remodeling to eventually be a bed-n-breakfast. 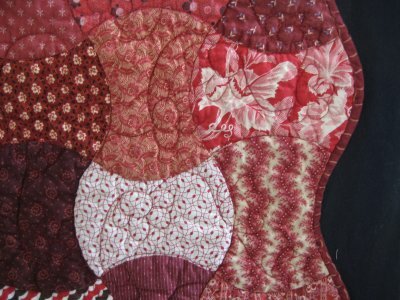 To help raise funds for the remodel, my quilting buddy sells quilts that she makes. At one point in early 2011, she made a request on the About.com Quilting forum where a lot of us hang out. 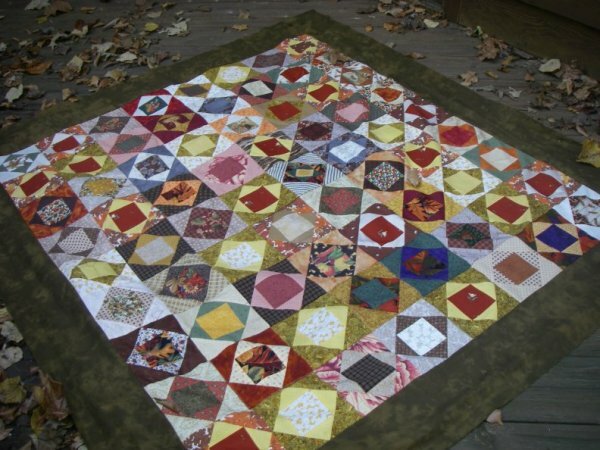 She asked if we would so kind as to make some Economy Blocks in Autumn colors for a fund-raising quilt. In return, she would send us some die cut shapes. I was between projects at the time and was happy to make some Economy Blocks for her. 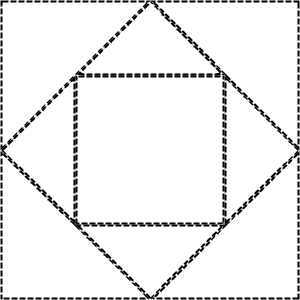 As you may or may not know, the Economy Block is a simple block to do but you can get messed up with the triangles. To ensure that my blocks would be the correct size for her to use, I decided to make mine with the Freezer Paper-Piecing method. 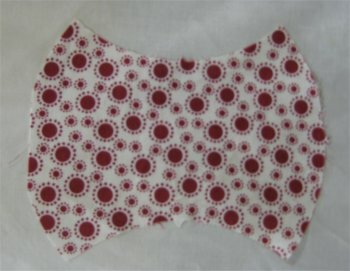 Freezer Paper-Piecing is a superior technique to regular paper-piecing. It gives you the same accuracy but since you don't *sew through* the freezer paper, you don't have to tear it away afterwards (something I always regarded as Another Project, which I simply dreaded.) In fact, the freezer paper patterns are *reuseable* as long as the freezer paper can be hot-ironed to the fabric! I was taught this technique by Judy Mathieson, who creates exquisite ariner's Compasses with this method. If you are interested in learning this technique, I have a tutorial on Freezer Paper-Piecing. With my freezer paper template/pattern, I was able to make an Economy Block in about 2 seconds. Well, maybe a tad longer, but not much. This was such a satisfying experience ... and I had nothing else to do that evening ... so I continued making more Economy Blocks. And more. And more! In the end, I believe I made 27 blocks for my quilting buddy! They were kinda like eating potato chips ... you can't eat just one and neither could I make just ONE Economy Block! So, I mailed the blocks off to my quilting buddy, with a note saying that the fun of making the blocks was more than enough "repayment" for me, so she shouldn't feel that she needed to send me anything in return. Truth to tell, I had a LOT of my own projects waiting for my attention so that something from her would just be One More Thing to do. I knew that if I didn't do SOMETHING with those apple core pieces RIGHT NOW, they would languish forever. I set to moving the pieces around to see what struck my fancy. Eventually, I settled on a table runner project ... this was the best use for the number of apple core pieces that I had. 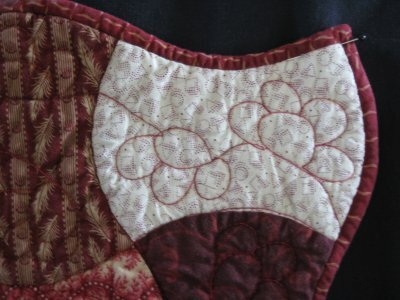 I learned how to sew curved seams from Laura Nownes (a nationally known, respected and fantastic quilting instructor and author), when a project I made in a class with her featured 3" Drunkard Path blocks. With that experience under my belt, I have never been intimidated by any curved seam. :-) The curved seams of the apple core pieces were just another seam to sew. Seeing as how the project was going to be a table runner, I was torn as to how to finish off the edges. I could leave them as-is ... curved. That would be simple enough; bias binding would take care of the finishing. A curved edge would be unusual. But, I could also "fill-in" the empty spaces on the perimeter with half-pieces, thereby creating a rectangular table runner. This might look better on the dining room table, as it would match the shape of the table. A straight edge would easy to finish. Oh, which to do? which to do?? If I left it as a curved edge, I was ready to finish it off right now. If I wanted a straight edge, I'd need to make the half-pieces ... and a little bit more work. I'll admit to you right now that I'm a lazy person and more work on this piece didn't particularly appeal to me .. so a curved edge it was! Eventhough the table runner was a small project, I opted to quilt it on my longarm machine. I like the ability to see the entire surface as I'm quilting; that kind of visibility gives me a better sense of where free-motion quilting designs should go for a more even distribution. I know that when quilting on my home sewing machine (a Janome 6500, which I just *love*), the spacing tends to be much closer together simply because my field of vision is smaller. This is great for stippling; not so good for meandering. And a meander variation is what I did. First I SITD along the seamlines to stabilize it, then I used one of Darlene Epp's meandering variations (Half Daisy Meander) for the quilting. The table runner turned out so cute that I've made tentative plans to make coordinating placemats. Oh, and by the way, my quilting buddy also had me quilt the resultant Economy quilt! Here's a picture she sent me of the top, so I would have an idea of what I was going to be working on. And another picture of her top loaded onto Lizzie. Interestingly, I evidently didn't take any pictures of the completed quilt. A shocking deficiency on my part. I also don't have any information regarding the final outcome of the quilt with respect to how successful it was in contributing to the remodel fund.